Home » Food Business » Bagoong alamang beneficial to human health? Bagoong alamang beneficial to human health? 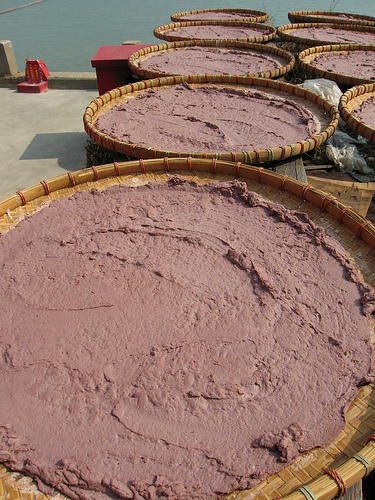 Fish or shrimp paste condiment, locally known as bagoong, is almost inseparable from manggang hilaw and other traditional Filipino delicacies. It persists and remains to be part of our regular diet and is used as a flavor extender in the preparation of some types of indigenous foods. However, several misconceptions on health hazards arise from the fact that bagoong is prepared from the wet-treatment of fish or shrimp fry with adequate amount of salt over a long period of time. Unknown to many, bagoong alamang (Acetes sp.) contains a relatively high level of an essential fatty acid technically known as docosahexaenoic acid (DHA), a polyunsaturated fatty acid that has beneficial effects on animal and human health. This is among the salient findings of a collaborative study conducted by Dr. Nemesio Montaño of the Marine Science Institute (MSI) in UP Diliman and Dr. Victor Gavino of the Department of Nutrition, University of Montreal in Canada entitled Polyunsaturated Fatty Acids of some Traditional Fish and Shrimp Paste Condiments of the Philippines. The researchers assessed the content of polyunsaturated fatty acids in six types of shrimp and fish paste condiments namely: dalagang bukid, dilis, padas-1, padas-2, terong, and alamangin the Philippines. The samples’ water, salt (NaCl), ash and fat content were analyzed through some chemical processes in order to determine which of these samples contain the highest proportion of polyunsaturated acid. Significant results of the study revealed that among the six fish and shrimp paste condiments analyzed, bagoong alamang represents the highest source of DHA. The DHA is a fatty acid essential for neural development in infant during its first few years. The acid components also perform a vital function in brain and retinal development. Surprisingly, it also plays an important role in preventing stroke, heart disease, arthritis, and non-dependency on insulin for diabetic persons. This fact may be attributed to the presence of essential water-binding solutes such as proteins, peptides and carbohydrates. The presence of these water-binding solutes lowers the water activity, thus limiting the growth of microbes. This is the principle why fish and shrimp condiments have long shelf-life even when refrigeration is not uniformly available and where ambient temperature is tropical. In general, all the fish and shrimp condiments analyzed contained polyunsaturated acids at measurable amounts or proportions.